Get a free mp3 speaker from Pringles – LOVE THIS! So I got home from our Mexico trip and had this awesome box from Pringles on my doorstep. Inside was a can of Pringles and this neat speaker that I can use with my iPhone. What’s cool about it? Well we promptly ate all the Pringles so we could use the speaker – which goes on the top of the Pringles can! The can helps to create the base for the music and it’s really pretty great sound!! You can get a free speaker too! All you have to do is buy four Super Stack Pringles cans between now and October 15th. Keep your receipts and send in the receipt and the UPC code and you’ll get a speaker too. It’s so worth it! I’ve actually packed it up to take it to the beach later next month. 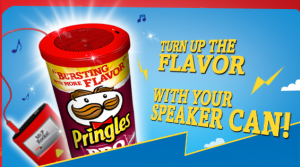 Visit the Pringles website to follow their directions and get your speaker too! « Minecraft Addicts: Legos, a Pickaxe & More!